Even as a manager of training and development and member of Human Resource leadership, I spend too much time sitting in front of a computer. As a 30-something (ok, almost 40-something) in today’s healthy-focused society, I’m well aware that this isn’t good for my heart (nor my mid-section). In 2014 I’m trying to focus on health, and have been looking for ideas on how to burn calories at work. As such, I turned to the experts at Mayo Clinic and their suggestions for being more active at work. From their list, I have chosen following seven ways to incorporate healthy habits into my day. Walk or bike to work. If you ride the bus or the subway, get off a few blocks early or at an earlier stop than usual and walk the rest of the way. If you drive to work, park at the far end of the parking lot—or park in the lot for a nearby building. In your building, take the stairs rather than the elevator. You’ll burn more calories standing than sitting. Stand while talking on the phone. Better yet, try a standing desk—or improvise with a high table or counter. Eat lunch standing up. Trade instant messaging and phone calls for walks to other desks or offices. Rather than hanging out in the lounge with coffee or a snack, take a brisk walk or do some gentle stretching. For example, face straight ahead, then lower your chin to your chest. Or, while standing, grab one of your ankles—or your pant leg—and bring it up toward your buttock. Hold each stretch for 15 to 30 seconds. Organize a lunchtime walking group. You might be surrounded by people who are ready to lace up their walking shoes. By walking together, you’ll hold each other accountable for regular exercise. Enjoy the camaraderie and offer encouragement to one another when the going gets tough. When it’s practical, schedule walking meetings or walking brainstorming sessions. 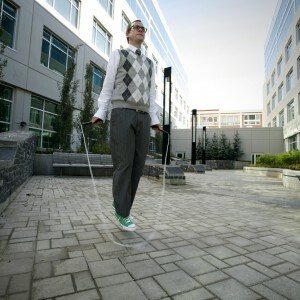 Do laps inside your building or, if the weather cooperates, take your walking meetings outdoors. If your job involves walking, do it faster. The more you walk and the quicker the pace, the greater the benefits. If you’re stuck in an airport waiting for a plane, grab your bags and take a brisk walk. Choose a hotel that has fitness facilities—such as treadmills, weight machines or a pool—or bring your equipment with you. Jump ropes and resistance bands are easy to sneak into a suitcase (or a briefcase for a regular workday). Of course, you can do jumping jacks, crunches, and other simple exercises without any equipment at all. Now that you’ve seen what I’m going to be doing this year to be more active, which ones can you commit to? Do you have any other ideas for staying active at work?